​It's hard to accurately depict the atmosphere before, during, and after the storied key ceremony of the MV Derby - where one lucky winner of the shore fishing category turns his or her key for the chance to win a brand new boat, engine, and trailer. This year, Cape Codder was fortunate to have the opportunity to provide said boat (along with Tohatsu who provided the impeccable 90HP four-stroke). This year's winner, John Stasiuk of Southern CT, was one of four shore all-tackle first prize winners (one for each species in the tournament: striper, bluefish, false albacore, and bonito) all of whom had an equal opportunity to win the grand prize boat package. John's striper of 29.61 lbs topped the leaderboard in that category from...get this...day one of the 35 day Derby. When asked about the stress of catching the top shore caught striper on day one of the derby John remarked, "I fully assumed my fish would be bested...so I never really worried too much. It wasn't until the last day that I realized I had held out...and the stress kicked in." John fished the Derby alongside his son (seen nearly tackling his shocked father during the key ceremony). The Cape Codder 19 Derby Edition will be John's first boat...giving them an opportunity to fish in the boat category next year (which comes with a chance to win a car donated by the generous Clay Family). While the prizes for the MV Derby are nothing short of world-class as far as fishing tournaments go, its clear that the nearly 3,400 participant's tireless fishing in the Derby is motivated by a love for the camaraderie, history, and respect for the 72 year old fishing tournament. As Bob Dobias of Cape Codder stated following the famous key ceremony, "We didn't know much about the Derby before agreeing to sponsor earlier this summer, but it's safe to say it has greatly exceeded any expectations we had for it." In addition to thanking the Derby Committee, all other sponsors, and participants Cape Codder would like to extend a special thanks to Tohatsu, Advance Coatings, SIMRAD, Cheeky, Narragansett Brewing, and YETI for partnering with us to provide the grand prize boat package. Grand sponsorship of the Derby was nothing short of amazing, giving a first-row glimpse into the iconic, New England tradition. ​Cape Codder, fresh off an amazing weekend on MV, is back to building purpose-built custom fishing boats "designed for Derby winners". As for John Stasiuk...he's ready for spring to come so he can get on the water in his new Cape Codder 19 - and based on his son's reaction last weekend, he'll have an eager co-captain. Cape Codder Selected as the Grand Sponsor of the 72nd Annual Martha's Vineyard Striped Bass & Bluefish Derby! 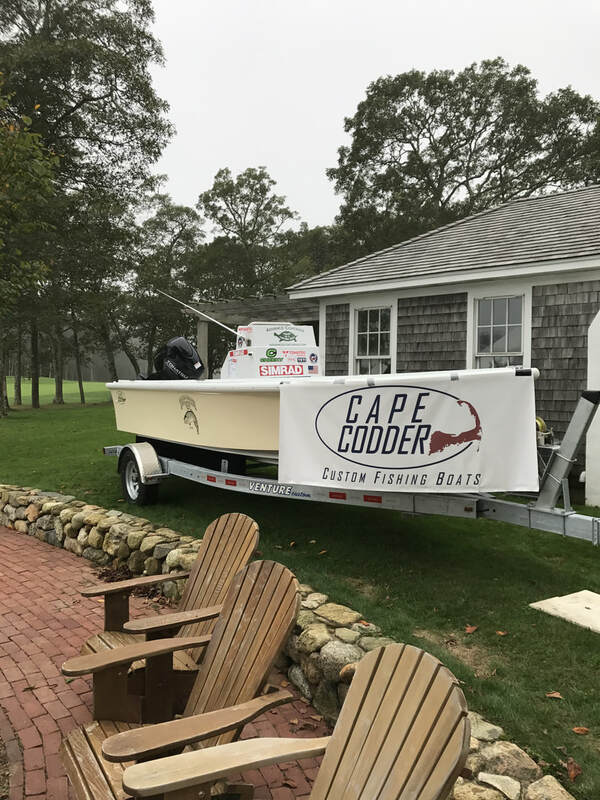 Cape Codder is pleased to announce our Grand Prize Sponsorship of the 2017 Martha's Vineyard Striped Bass and Bluefish Derby! We will be giving away a brand new Cape Codder 19 with90HP Tohatsu Four Stroke Engine to one lucky winner of the Derby. Fish on! Annually, the Martha’s Vineyard Striped Bass & Bluefish Derby attracts fishermen from around the country to visit the beautiful island of Martha’s Vineyard and enjoy its world-class fishing. The Derby is the most historic, successful, and popular saltwater fishing tournament on the East Coast. Each year, over 3000 anglers participate in the contest, which is now recognized as a true “Fall Classic” of fishing. Be sure to check out @mvderby on facebook and share the HUGE news! Cape Codder is excited to be sponsoring the 2nd annual North Shore Striper Blitz in Beverly, MA from June 16 to June 17. The North Shore Striper Blitz is a charity fishing tournament created by local Anglers for Anglers in the greater North Shore area to benefit local charities. The goal of the committee is to pass every dollar raised directly back to the charities that the tournament supports and to donate all the fish caught back to local food banks. This year’s recipients are the YMCA of the North Shore and another family related charity to be identified later. The annual event takes place on Friday/Saturday of Father’s day weekend each year. The 2017 Tournament will be held at Glover Wharf in Beverly on Friday June 16 and Saturday June 17, 2017. Cape Codder will be joining other area sponsors in putting on this awesome tournament. Entry includes fishing, food, local beer, a t-shirt, and an opportunity to hang with Cape Codder at the after party. Best of all - its Father's day, so Dad has free reign over the weekend! Click the button below to register! Register for the North Shore Striper Blitz! “Just stumbled across your website and was very surprised and pleased to see that Cape Codder boats are again being made. I noticed on your website the testimonies that you've heard from owners about the boat's performance and durability. Well I could tell you a few. My dad was a bullraker in Bristol, RI. First, back in the late ‘50s to early ‘60s then again from ‘79 to ‘85 when an accident on his 60 ft dragger nearly took his life. He purchased a used ‘78 Cape Codder 19 in about the Summer of 1980, when he was quahogging full time, and outfitted it for bullraking. As you know Winter on New England waters can be a very inhospitable place to be working. The Winters of ‘80 and ‘81 on Narragansett Bay were a perfect example. At least one, if not both of those Winters, the Bay froze over. Nearly all of Bristol harbor to Hog Island and all of the upper bay except the channels was frozen over. The Coast Guard boat from Bristol had cut through only half of the harbor and allowed the ice to drift out toward the channel when the tide went out but left the head of the harbor and the docks, where there were dozens of full time shellfishermen, still locked in and unable to go to work. My Dad, who at the time had a 225 Mercury on the Cape Codder, launched at the State Street dock as he always did and proceeded to not only break a path through the approx. 4" thick ice to the now open area of the harbor, a distance of a couple hundred feet, but then cut a path around the docks and halfway across the other side of the harbor which allowed all of the diggers to get out to work and earn a living. He did things like this more than once. Several times during those Winters the other quahoggers, many with flat-bottom skiffs, would wait for him to launch and cut a path to open water so they could get to work. While not exactly recommended use, he always had confidence in the boat's toughness and solid construction and it never failed him. I could tell you of other examples of the boats faithful service to him and to my brother who later purchased it from him. My dad is now in Heaven and my sister and I are in the process of rebuilding and refurbishing the boat.